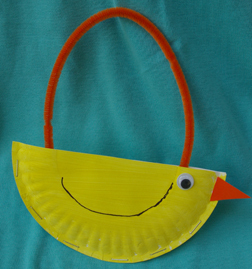 Your preschooler can make a cute Easter chick purse, or use it for a class party and fill with Easter candy! What You Need: 1 dessert-size paper plate; nontoxic yellow paint; paintbrush; stapler; scrap of orange cardstock or construction paper; googly eye; black marker; scissors; glue; orange pipe cleaner (or use yarn). How to Make It: Paint at least half of bottom of paper plate yellow. Let dry. Fold in half and secure with staples (adult help, please!). Use black marker to outline a chick wing. Cut triangle shape for beak and glue on. Glue on eye. Staple pipe cleaner to back side of “purse” for handle. 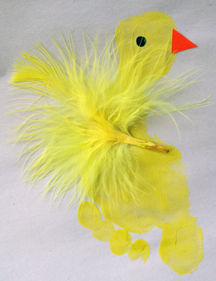 The child’s own footprint forms the base for this cute yellow chick! This craft is great for Easter, but would also work for a farm unit at school. What You Need: Yellow paint (nontoxic washable); paintbrush; sheet of white or cream construction paper; scrap of orange cardstock; black marker; yellow feather; glue. How to Make It: Help child paint a clean foot yellow. (Alterative: step into a shallow tray with yellow paint in it.) Press foot onto construction paper and lift away slowly, without wiggling. Let dry. The heel is the chick’s head. Use black marker to add eye. Cut triangle shape from orange cardstock and glue to “face” for beak. Glue feather to body. If you’d like, children could glue birdseed or Easter grass to the paper as well.